Miracle Mattress In the days leading up to the 15th anniversary of 9/11, at least three people thought it would be a good idea to re-enact the World Trade Center attacks using stacks of mattresses for a commercial promoting a Twin Tower Sale. Miracle Mattress quickly apologized and closed its doors "indefinitely." 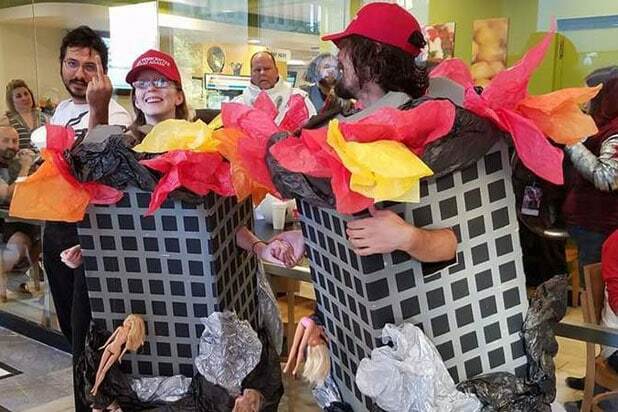 Cosplayers On the weekend before the 15th anniversary of the Sept. 11 attacks, two aspiring pariahs attending Dragon Con in Atlanta showed up in matching Twin Towers costumes, complete with tissue paper jet fuel fire and Barbie doll window jumpers. They reportedly lasted just an hour at the annual sci-fi/fantasy/comic-book convention. Walmart A Twitter user visiting Panama City, Florida, during the week of 9/11's 15th anniversary was struck by this Walmart display commemorating Ground Zero with twin towers of delicious, calorie-free Coke Zero. It's what survivors of the tragedy would have wanted. Well, besides better pre-9/11 information-sharing between America's intelligence agencies. 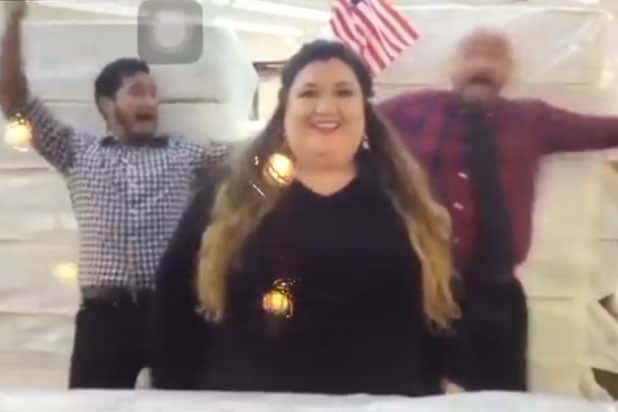 Zales You could cut glass with the pointed comments from critics of The Diamond Store's September 2015 promotion at an Omaha, Nebraska, location, which it hyped with signs that read, “Ask us about 9/11." Zales tripled down on the tone-deafness by appearing to cop the slogan adopted after the Sept. 11 attacks -- "Remember, Rebuild, Renew" -- replacing it on brochures with "Renew, Reset, Restyle." Jerry Casale The Devo co-founder and his bride-to-be were getting married on Sept. 11, 2015, so they decided to honor their nuptials and 9/11 with box cutter party favors and table cards. The centerpiece of the affair, though, was a cake modeled after the Twin Towers that Casale claimed was a surprise given to the couple by a friend. Melissa Joan Hart After lambasting the news media on social media for not properly remembering 9/11, the actress-turned-clothier worked in a plug for her company, King of Harts, noting that its website was offering free shipping in honor of the victims, families and first responders of the Sept. 11 attacks. Florida Gun Supply Bottomless font of cultural slapstick Florida got back on the board during "9/11 week" in 2015 when the Inverness gun shop paid its respects to the lives lost to senseless tragedy with a $25 discount deal. 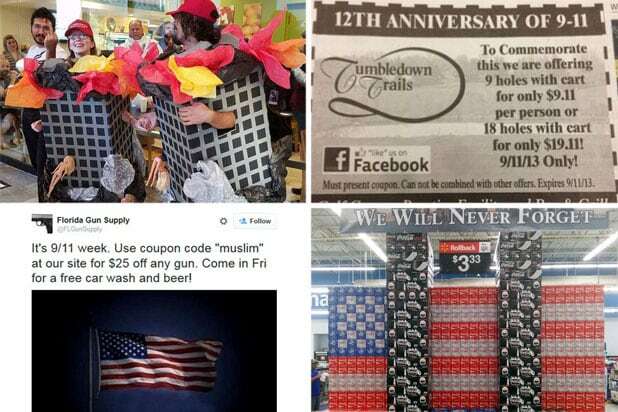 All would-be shooters needed to do to claim the deal was enter the promo code "Muslim" on the store's website. Really. Bikram Yoga Arlington “Freedom Isn’t Free," the Virginia yoga studio's online promotion read, but it is 20 percent off during the anniversary of the worst attack in our nation's history! In honor of the "patriots who have died for our country," Bikram Yoga Arlington offered a week of classes for $40 instead of the normal $50 in 2014, and then went all conspiracy theory in defending itself against its detractors. Tumbledown Trails Golf Course The Wisconsin golf course offered a special in 2013 for those solemnly commemorating 9/11 on the links. A coupon in the newspaper extended duffers a one-day deal on a half-round of golf, collapsing its nine-hole rate to just $9.11. A series of post-backlash Facebook posts by the course evolved from restoring the normal price and donating the difference, to pleading for forgiveness, to closing temporarily out of concern for staff safety. Coeur D'alene Casino As a "thank you to our heroes who protect and serve our community" in 2012, the Idaho casino offered active military, veterans, doctors, nurses, first responders, air traffic controllers and 911 dispatchers reduced rates on rooms. It included a $9.11 food voucher. New York Sports Club In the month leading up to the 10th anniversary of 9/11, the New York City gym chain offered surviving first responders $20 memberships for life -- enraging some while attracting the business of others. What probably didn't help was restricting applicants from using the club during the hours of 4:30-7:30 p.m. on Monday through Thursday. "Thanks for your service, officer, but the line for this elliptical is long enough already."